Five people have reportedly died as a result of a stampede at the entrance of the Godswill Akpabio International Stadium in Uyo, the Akwa Ibom State. 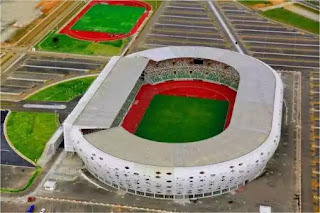 The stadium was the venue of the World Cup qualifier match between the Super Eagles of Nigeria and the Chipolopolo of Zambia. According to Punch, may people were also injured while trying to avoid the soldiers who were wielding sticks. The Police Public Relations Officer, Elkana Bala has however debunked the report, saying nobody died. The Super Eagles beat Zambia 1 – 0 to qualify for the Russia 2018 World Cup.